ALLEN ELISHEWITZ MID TECH FRAME LOCK PIRATE. 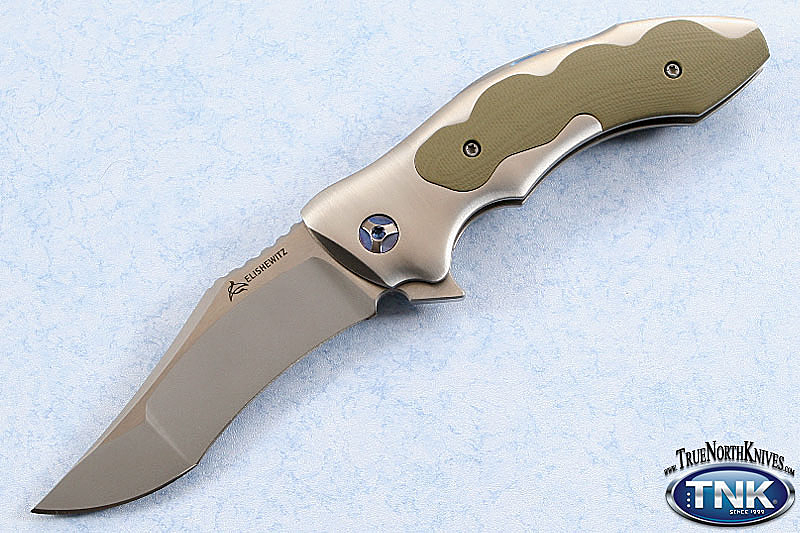 ALL TITANIUM FRAME LOCK FLIPPER FOLDER WITH G-10 INLAYS. MULTI GROUND RWL-34 STAINLESS STEEL BLADE. STEVE KELLY PIVOT. EXCLUSIVE CUSTOM DESIGNED POCKET CLIP WITH BALL BEARING FOR SMOOTH SECURE DRAW. CUSTOM LOGO ELISHEWITZ POUCH. LIMITED CLOSED RUN. KNIVES ARE BUILT BY ALLEN HIMSELF IN HIS SHOP IN TENNESSEE.